The buzzing of bees around blossoming fruit trees was once a sign of spring unfurling in the Valley of Heart’s Delight. And while the prevailing sound these days is a year-round hum coming from Silicon Valley’s tech corridors, Santa Clara County has not entirely lost its rich agricultural heritage. Mushrooms, nursery products, peppers, tomatoes, lettuces, cherries and wine grapes are the leading crops. One has only to follow Santa Terese Boulevard over a low rise on the southern edge of San Jose to arrive in a part of the county that looks a whole lot like farmland. A developer standing on that rise, gazing over the seven- by two-mile expanse of Coyote Valley a decade or more ago, probably would not have been admiring the pumpkin fields. More likely, he was plotting out the routes between soon-to-be tech campuses and warrens of classy retail and housing. If he felt a chilly wind nipping at his neck, it might have been a premonition of the Great Recession blowing in. Could agriculture and conservation be sustained in Coyote Valley even as development continues or quickens? Does San Jose need new land for jobs and housing, or can it accommodate growth within its urban core? In an expanding economy, can South Bay communities still assign high values to locally grown food, places for outdoor recreation and habitat for wildlife? Time will have its answers. Meanwhile, here is a brief look in on activity in Coyote Valley at year’s end. On the north end of Coyote Valley in early November, acres of tall sunflowers beam their last yellow rays over the Spina Farms Pumpkin Patch at the corner of Santa Teresa Boulevard and Bailey Avenue. A few stray pumpkins passed over for jack-o-lanterns lie unpicked in the fields as John Spina (father and son) work with a few farm hands to deconstruct the rides that carried ebullient children among the crops. Shelves and bins at the Spina family’s farm stand still brim with late-harvest tomatoes, peppers, squash, apples and nuts. “The people are right there,” says the elder John Spina, indicating the close proximity of his farm to urban consumers. The original farm, started in 1944 by John’s father, was an orchard in the middle of San Jose. They relocated to Coyote Valley in 1965, planted row crops and set up the farm stand for sales direct to consumers. The Spina’s key to success in Coyote Valley has been diversification: tree and row crops through spring and summer, the Pumpkin Patch, firewood and Christmas trees in winter. The Spinas are among the few growers offering direct sales in Coyote Valley, so a stranger meandering the grid of farm roads in the off season can only guess who is growing what. Pete Aiello, general manager of Uesugi Farms, stops by the quiet and undistinguished northeast dead end of Richmond Road, location of his now-cleared cornfield. He’s recalling the raucous feasting of the crows in late summer when a heat wave caused the maturing ears to burst out of their husks. Peppers, pumpkins or Napa cabbage might be planted here next summer, and by then Aiello hopes to have a new high-tech irrigation monitoring system running from his smartphone. Such technology is important to a big operation like Uesugi Farms. With 5,000 acres in production through the year across eight California counties and into Mexico (including 40-plus leased acres in Coyote Valley), Aiello is providing ever-growing urban markets with a wide range of crops through all four seasons. He’s always in search of additional acreage to meet that demand. “If we’re looking for more ground, this is the spot,” Aiello says, indicating that the Coyote Valley soil, the climate and especially the location are ideal. Having a place to grow in this unincorporated part of Santa Clara County so near Bay Area consumers is a great asset. “City limits have not yet encroached, but it’s ‘when’ not ‘if,'” he says, believing the development pressures will not let up even as demand for food in San Jose, the fastest growing community in the Bay Area, increases. Like most experienced farmers, he sees endless opportunity for producers–as long as there are fields to farm. “There’s room for everybody in the food field,” he says. Among those who want Coyote Valley to be a welcoming place for beginning farmers is Andrea MacKenzie, general manager of the Santa Clara Open Space Authority, who describes Coyote Valley as “arguably the most important agricultural and natural landscape remaining in the South Bay.” Her public land conservation agency is able to protect natural and agricultural lands through land purchase and conservation easements. When they purchase properties from farmers who do not want to continue farming, they are able to sell the land back to new farmers at rates that could be 40–60 percent below full market value in exchange for an easement, which is an agreement that the land will remain in agricultural use. Many Coyote Valley growers do their work in spacious indoor facilities. The multi-story Monterey Mushrooms plant on Santa Teresa Boulevard is one of many such fungi farms this international company maintains across the continent. Mushrooms are a high-value “specialty” product, so this is a popular industry in many California growing regions, where the companies benefit from the ready availability of low-grade agricultural waste they can use as growing substrate. But far more numerous in the inventory of Coyote Valley covered growing spaces are the long, low, interconnected greenhouses of the Bay Area Chrysanthemum Growers Association (BACGA). Since NAFTA shifted flower trade to South America in the 1990s, it’s mainly food, not flowers, growing under these plastic-covered wood structures. This cooperative, established by Chinese-American farmers in 1956, now supports growers of specialty Asian greens like bok choy, gai lan and Napa cabbage. Second and third generations of those founding farmers–joined by more recent Asian immigrants–continue to benefit from BACGA membership. But just as in 1956, language barriers and limited resources to improve their operations create disadvantages for this farming group. On top of that is uncertainty about agriculture continuing here in the face of continued development. “That uncertainty is having a chilling effect on investment in agriculture,” says MacKenzie, whose organization is part of a coalition envisioning a brighter future for agriculture in Coyote Valley. Also at the heart of that coalition is SAGE (Sustainable Agriculture Education), a nonprofit founded in 2001 to protect and revitalize agriculture on the urban fringe. In 2012, with funding from the California Coastal Conservancy, the nonprofit produced a Feasibility Study and Recommendations for Sustaining Agriculture and Conservation in Coyote Valley. 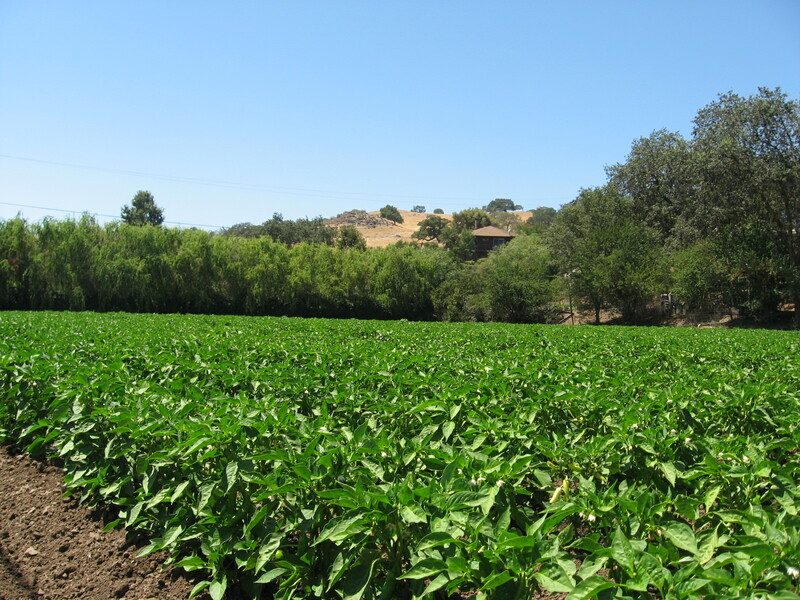 SAGE was then awarded a California Department of Food and Agriculture (CDFA) Specialty Crop Block Grant for increasing specialty crop production in Coyote Valley. Specialty crops (defined by the CDFA as fruits, vegetables, nuts and nursery crops) generally bring higher value at the market, but producing these crops can also take more investment, says SAGE director Sibella Kraus, who has identified BACGA as the group of specialty-crop growers in the valley most in need of technical assistance. During a stop at one of the greenhouse farms, a young Chinese- American woman translates for an elderly farmer, who makes it quite clear that he is not to be identified in any reporting. The meeting was arranged so that Kraus and Drew Mather, a soil conservationist for the Natural Resource Conservation Service, could hear feedback regarding this farmer’s participation in the CDFA grant-funded weed management demonstration trials. The farmer has been testing the efficacy of a new type of seeder intended to make his crop of greens easier to weed. With upkeep of the greenhouse structures as his highest annual expense, this farmer watches all expenditures. He understands that the cost of the seeder, were he to purchase one, could be offset by savings in labor, but he’s not keen on new approaches, including Mather’s other suggestions for flame weeding or crop rotation. Mather comments in an aside that “efficiency” for a long-time grower is often to do things the same old way, but he adds that this farmer is more open-minded than many in this group. When asked if there are any other innovations the CDFA grant could facilitate, the farmer suggests he might like to have some of those [GMO] pesticide-resistant seeds. On the Morgan Hill end of Coyote Valley, a group of college-bound students engage with leading-edge practices in sustainable agriculture as they maintain their recently planted hedgerow of fruit trees, edible herbs and native shrubbery along the western edge of their school’s “farm” classroom. These participants in Ann Sobrato High School’s acclaimed agriculture program have had the benefit of instruction and direction from an outside advisor, Sam Earnshaw of Hedgerows Unlimited, who was retained by SAGE to help enhance habitat on Coyote Valley farmland. Earnshaw teaches that use of hedgerows dates to the dawn of agriculture. Largely abandoned (and even deconstructed) in 20th century practice, they are now understood to play a key role in a healthy balance between natural and agricultural ecosystems, most notably as habitat for pollinators. With the hedgerow project well under way, SAGE is turning attention toward a new CDFA grant to help develop a business plan for a 10-acre organic demonstration farm on the high school campus. This will create more and wider opportunities for the Ann Sobrato students. Directing her charges in their afternoon farm/classroom activities, Tanya Callabretta steps away for a moment to talk about the importance of community partnerships, such as those facilitated by SAGE and the National FFA Organization, in a modern educational environment. Until the 1980s, FFA stood for “Future Farmers of America,” but as Callabretta explains, that “future” no longer means production farming. The stunning array of studies and careers her students will pursue include all the new technologies and engineering around food and farming, plus the increasingly vital environmental sciences that address depletion of natural resources. They might work in regulation and biosecurity; veterinary science; horticulture; culinary, floral, and landscape arts; product development; marketing; education; leadership; cultural studies, and much more. This long day of exploring agriculture in Coyote Valley ends at the Coyote Valley Open Space Preserve, which the Santa Clara County Open Space Authority opened on the west side of the valley in June 2015. Late afternoon hikers cast long autumn shadows as they head up into the wild lands, where they might encounter grazing cattle from Tilton Ranch to the south or innumerable species of wildlife. If they know what to look for, they might also perceive signs of tule elk, coyote, grey fox, American badgers or mountain lion. These magnificent creatures cross from the Santa Cruz Mountains to Mt. Hamilton and the Diablo Range on the eastern side of the valley via a “critical wildlife corridor” made up of Coyote Valley farmland and two US 101 underpasses. Wildlife technicians from the De Anza College Environmental Studies Department and independent researchers like wildlife ecologist Tanya Diamond of Pathways for Wildlife have mapped these corridors and captured images of these nearly vanished wild populations using remotely operated cameras. This ecosystem is still wild enough to be revered by naturalists, but can it stay that way? As the visit winds down, conversation about the future of Coyote Valley turns back to the students at Ann Sobrato High School and how their studies in Coyote Valley might inspire exciting paths ahead. Cheryl Angelina Koehler is the editor/publisher of Edible East Bay and the author of Touring the Sierra Nevada, published by University of Nevada Press.